Sponsors of Habitat for Humanity stand roof and rafters above other organizations. 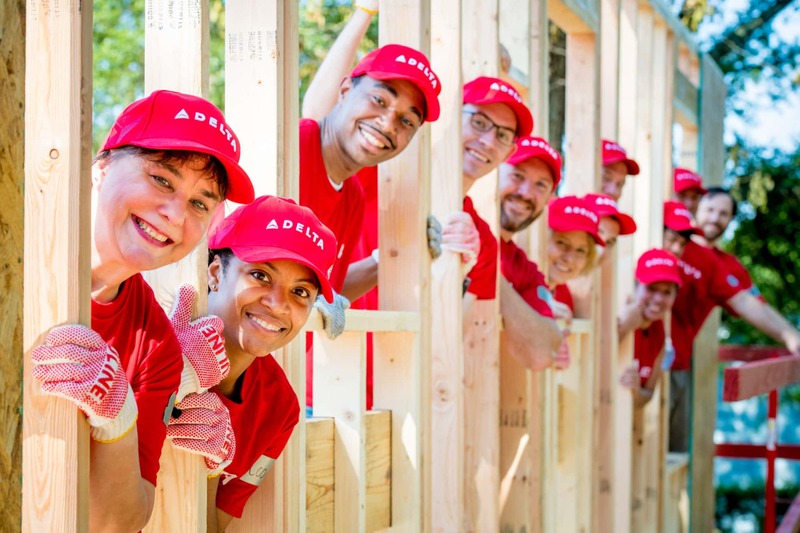 As leaders partnered with the world’s #1-trusted nonprofit brand, our sponsors are building solutions to the affordable housing crisis from the ground up. Whether you sponsor a home, revitalize a neighborhood, or support a program, you’ll enjoy incredible on-site experiences for your team, recognition options tailored to your priorities, and the satisfaction of knowing you’ve made a permanent difference in the life of your community. Families coming from poverty save an average of $82,000 during their time as Habitat SKC homeowners. Home sponsors break new ground for families, ensuring Habitat’s traditional work of new-home construction continues in King County. Benefits for home sponsors include exceptional hospitality, tailored build-day packages, custom media opportunities, and speaking time at home dedications. Read below about our current home sponsorship locations. Whether supporting a full home or a portion, home sponsors join the Habitat Family and make their own home with us on site. Contact us to inquire about remaining available home sponsorships. Neighborhood sponsors preserve more than homes. By supporting critical repairs and community-led events, they also help preserve a neighborhood’s character, diversity, history, and roots. Through smaller projects with fast turnarounds, neighborhood sponsors revitalize communities in real time, enjoying all the hospitality & hands-on fun of partnering with Habitat. Consider sponsorship of a full neighborhood, a single block, or a single home repair. Email us today and revitalize your community and your giving program. What keeps Habitat going strong after 40 years? A well-rounded model that keeps construction safe and fun for volunteers, trains families for success, draws on energy of yearlong AmeriCorps and VISTA members, and brings community together to do the work. Discover our programs below! As our own general contractor, many items such as power tools, heavy equipment, job trailers, material logistics and more are not covered by the costs we charge our homeowners. Consider becoming a construction program sponsor to keep our saws buzzing! Habitat selects and trains families for success – and 99.3% of Habitat families in King County have faithfully paid their mortgages in their time with us! This is due to the comprehensive homeowner education and financial empowerment classes homeowners offered by Habitat and our skilled team of pro bono trainers. Support the recruitment, training, supervision, and benefits offered to our wonderful team of 15-20 annual AmeriCorps and VISTA members who support construction, homeowner services, community engagement, development and our Habitat Stores. Thank you to an anonymous donor who has helped support our AmeriCorps teams over 12 years! From tool belts to tents, from scheduling to celebrations, the cogs and springs of a volunteer program hosting over 30,000 volunteer hours each year are complex. Volunteer program sponsors get to party with our “regulars” at our annual recognition event. Safety is paramount, especially when introducing new recruits to the world of construction sites. Hard hats, safety goggles, ear protection, harnesses and fall protection, scaffolding, and more all need to be in tip-top shape, while OSHA and competent-person trainings are a regular part of our operations. Receive a mention at every day’s safety briefing by becoming the Habitat SKC safety sponsor! Children who spend just half their childhoods in permanent homes are 4X more likely to graduate from college. With land harder to come by every day, Habitat needs our friends in the community to steer us toward opportunities to keep our pipeline full into the future! If you have a property or lead, please let us know! If your riches are in the form of supplies you can share, or skills you can offer, we may have a need for your gifts. Learn more about sharing goods.